This project will address pedestrian and bicycle mobility and safety, intersection improvements, traffic congestion and the overall "livability" of the Girard corridor from Gibson to Indian School. For more information or to comment as a user or neighbor of Girard Boulevard, please contact us. Construction/implementation is planned for Spring 2017! Over the last year, City Councilors Isaac Benton and Pat Davis have worked with the City’s Department of Municipal Development and an engineering consulting firm to produce detailed striping diagrams based on the Master Plan’s concepts. These documents would include detailed striping diagrams for the entire extent of the project, including bicycle lanes and "sharrow" markings where described in the plan document below, and sidewalk improvements for the segment between Central Ave. and Lomas Blvd. This is the next required step toward implementation of the Girard Blvd. Complete Street Plan. Notes: The intersection of Silver and Girard will be impacted by a separate project to improve the Silver Ave. Bike Boulevard. Bicycle lanes from Thaxton south to Gibson will be designed prior to implementation. 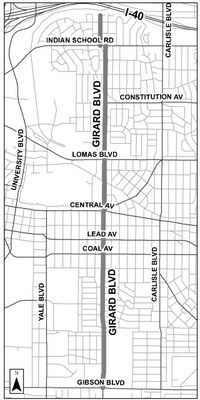 At the request of abutting neighborhoods and in light of new development and changing transportation needs at the University of New Mexico, City Councilors Isaac Benton and Rey Garduño are sponsoring a street improvement master plan study of Girard Boulevard. The purpose of this effort is to develop a comprehensive plan to improve the corridor for drivers, pedestrians, cyclists and other users. The final product will address pedestrian and bicycle mobility and safety, intersection improvements, traffic congestion and the overall "livability" of this collector street. The project team, including consultants Dekker/Perich/Sabatini and Fehr & Peers, began by analyzing traffic and accident data for the corridor, reviewing existing relevant plans and policies, and meeting with affected neighborhood associations and other key stakeholders, such as UNM, the city's Transit and Municipal Development Departments, and bicycling advocates, to develop an assessment of existing conditions, issues and opportunities along Girard. Once a clear set of issues was defined, a set of solution alternatives was developed and presented for comment at a public meeting on Aug. 23, 2012. Potential solutions discussed at this meeting included traffic calming techniques; pedestrian improvements such as refuges, signals and replacement of missing or deteriorating infrastructure; and on-street bicycle facilities such as lanes or sharrows where feasible. Participants were given the opportunity to provide input on their preferred solutions and improvements to the street. Following that meeting, the project team produced a Draft Girard Boulevard Complete Streets Master Plan, which is available for download below. This plan considers community preferences, existing conditions such as average daily traffic and the varying right-of-way width along the corridor and makes several recommendations aimed at calming traffic, improving safety and increasing use of the street by cyclists, pedestrians and others. These are broken down into less expensive short-term improvements, such as restriping and the addition of bicycle lanes where right-of-way allows, and longer-term projects such as sidewalk and streetscape improvements. Please feel free provide your feedback on the Draft plan using the contact methods below. The project team would be happy to present the recommendations in the draft at neighborhood association meetings or other community events upon request, and we can also schedule a second public meeting to discuss the Draft plan if there is interest. Feedback received on the Draft will be used to produce a final plan, which would guide future redevelopment of the street and set priorities for funding various improvement projects along the corridor. Download the March 2013 Draft Girard Boulevard Complete Streets Master Plan. Comment Form: Click here to submit your comment in an online form. EMAIL: [email protected] Please include your name and physical address in your email, and please use the subject line “Girard Boulevard Complete Streets Plan." MAIL: Send written comments City of Albuquerque City Council Services, Attn: Shanna Schultz, P.O. Box 1293, Albuquerque, NM 87103-1293. Please include your name and physical address. The following corrections have been suggested by stakeholders to date. The Project Team will incorporate them and any additional comments received before June 30 into a final draft of the Plan, which will be published in late summer 2013. Page 11 – in the second paragraph under the “Bicycle Conditions” subhead, clarify that while the in-progress City of Albuquerque Bikeways and Trails Master Plan proposes a Bicycle Boulevard on Dartmouth between Campus Blvd. and Silver Ave., Dartmouth itself runs from approximately Burton to Lomas. It resumes north of Jefferson Middle School and continues from there to Indian School. Pages 15 - 17 – update discussion about Jefferson Middle School with timeline for proposed on-campus loop road and other student drop-off changes. Page 15 – update Table 1 to correct error in Average Daily Traffic column (should be the sum of the north-bound and south-bound column). Page 27 – Add language about monitoring and mitigating unintended consequences of a lane reduction in this segment, such as cut-through traffic. Pages 32-36, Intersection Graphics -- Remove depiction of on-street sharrow graphics as indicators of bike lane continuation through the intersection, replace with standard bike-lane markings per the Federal Highway Administration's Manual on Uniform Traffic Control Devices (MUTCD). Throughout – expand discussion about left turn lanes that were temporarily installed on Girard during the Lead/Coal project and later removed. Several stakeholders have requested that left turn lanes be reinstalled on Girard at Lead and Coal. Throughout, especially between Santa Clara and Gibson – program additional speed limit signs, on-street graphics, etc. and other tools to reduce speeding. Throughout – include discussion/exploration of reducing speed limits on parts of the corridor from 35 to 25 mph. Click the links to download PDF files of documents from the August 23 Community Meeting. On-Street Bicycle Facility Concepts These presentation boards show different options for on-street bicycle facilities and were created for discussion at the August 23 meeting. Implementation will depend on available right-of-way, on-street parking and other factors. Intersection Concepts for Central to Lomas Segment These draft illustrations explore options for getting dedicated bike lanes through the segment of Girard between Central and Lomas and were developed for discussion at the August 23 meeting. Public Comments This document summarizes comments heard during the open house and presentation discussion on August 23. The planning team will consider them, along with input received through other channels, as it develops the draft plan for the Girard Boulevard Corridor.